Confidence can be a major challenge for freelancers. It’s easy to think freelancers are full of guts and bravado, stepping out on their own ready to be their own boss. But the reality is freelancers aren’t always so confident. A lack of confidence is one of the top things that can stop freelancers from succeeding. But the painful reality is that nearly every freelancer struggles with confidence. Too often freelancers suffer from imposter syndrome. Imposter Syndrome is an inability to internalize your accomplishments and a persistent fear of being exposed as a fraud. For example, if you’ve ever balked at raising your rates, worried that you can’t possibly charge that much—you’re dealing with Imposter Syndrome. More signs? If you secretly compare your abilities to those around you, and it’s hard for you to accept compliments about your work, you’re probably dealing with Imposter Syndrome. Freelance Leap Year is a year-long course designed especially for freelancers. Each month, we’ll cover a new theme to help grow your business, including Confidence. Register here now. Identify what’s undermining your confidence, and address it. This can vary wildly depending on the individual and what works or doesn’t work for them. Maybe you don’t have the experience or you lack the skills or you don’t have the business sense. Whatever is holding you back, identify it, and figure out how to neutralize it. Don’t have the experience you think you need? Nothing like learning on the job. Do you lack the skills you need? Take some classes. Don’t know anything about business? Find a mentor. Hire an accountant. Take a class. Every freelancer struggles with finances. Finances are a common stressor, and worrying about it can seriously undermine your confidence. Even veteran freelancers can be shaken by the feast or famine cycle of freelancing. So shoring up that bank account can go a long way. Charge more: Nothing makes you feel more confident like making more money. Worried about raising your rates? Don’t be. The vast majority of the time your clients are happy to pay more. Charge what you’re worth and avoid “resentment pricing.” Learn more about raising freelance rates. Save more: Having something to fall back on when the jobs dry up can help keep the panic at bay. There’s a big difference between writing a proposal when you absolutely have to get the job to pay your bills vs. being able to fall back on your savings. That kind of desperation is the opposite of confidence. Sometimes you need to be able to say no. Work more: If you haven’t gone full time yet, hang on to that day job a little longer. Get a part time job if you need to. That safety net can give you the confidence to figure out freelancing. Sometimes freelancing can be a lonely business. You often work alone in a home office or alone in a crowded coffee shop. Especially for an extrovert, all that alone time can be draining. Find people to connect with. But not just folks to hang out with—be intentional. Find mentors who can help and challenge you. Find fellow strugglers who understand what it’s like and hold each other accountable. When you have people to talk to who understand the freelance world, things won’t seem quite so strange and alien. You’ll have more confidence moving in this world when you know you’re not alone. Check out our Freelance Leap Year course to get the help you need to grow your business and join a community of fellow freelancers. Since freelancing can be a lonely business, even when you win big there’s often no one there to exchange high-fives with (except maybe your fellow coffee shop patrons; hey, high-fives with strangers is better than nothing). Sometimes you have to pat yourself on the back. Take time to reflect on and celebrate your wins. Treat yourself to lunch. Reward yourself with a walk in the park. Take that vacation you’ve been pining for—even if it’s just a weekend away. Taking time to celebrate a win and focus on the positive is actually a proven way to overcome the mind-numbing busyness that can ruin your work. Often a lack of confidence is about a specific challenge that’s holding you back. More than something you just don’t know, it’s something you’re afraid of. The only way forward is to confront your fears. If you’re afraid of public speaking, start doing it. If you don’t like giving pitches, give pitches. If you struggle with talking on the phone, force yourself to make more calls. The only way to overcome these things is to do them and get better at them. Yes, some of this advice has talked about addressing your weaknesses, and that’s important. But it’s also good to lean into your strengths. Often your strengths are where you can have the greatest advantage as a freelancer. Narrowing in on a freelance niche is always an effective strategy, and when it’s a strength, it’s one where you’ll excel. It’s a good way to be known for something, and that’s a major confidence builder. Growing, learning, and stretching your skills are good ways to build confidence. There’s always something new out there, and rather than be overwhelmed and intimidated by it, devour it. Learn it. Apply it. Then charge for it. Everybody makes mistakes. The important thing is to learn from those mistakes and get better. Don’t obsess over a mistake and allow it to undermine your confidence. Learn from failure, change your process, and use it to become better. Don’t let failure stop you. Use it to move you forward. It’s tempting to compare yourself to others in the freelance world. That’s a losing game. There’s always someone who’s more put together, doing better work, making more money, taking more vacation—making you feel less than. But they’ve also been doing it longer, are in a different niche, have different skills, and different priorities. Be your own person. Learn from other people, sure, but don’t get dragged into the comparison game. If you’re going to compare yourself to anyone, compare yourself to your clients. In their eyes, you’re a magician. You can do things they have no idea how to do, and they’re happy to pay you to do them. Shonda Rhimes runs a multi-million dollar TV empire (Grey’s Anatomy, Scandal—that’s her), yet she also struggled with confidence. She overcame it by saying yes and embracing a whole series of things. What’s most compelling about her story is many of those things had little to do with work. Being confident in your personal life, where you can control some things, can bleed into your professional life, where you often have less control. There’s a lot that’s out of your hands as a freelancer. So being on top of the things you can control is one way to build confidence. Dress for success. Exercise. Eat well. Get sleep. If you take care of yourself, you’ll lower stress, you’ll have more energy, you’ll feel better. That won’t fix every challenge you face as a freelancer, but it will make you better able to tackle them. Let’s be honest: A lot of days you’re going to feel a lack of confidence. Even if you do all of the above, you’re still going to have those days. The key is to carry forward. Eventually, you’ll realize you’ve had fewer of those days and more days when you actually can do it all. You never see the progress in building confidence because it’s not a wall in front of you, it’s a foundation below you. You’re often so busy doing the work that you don’t realize the ground has shifted from shaky to solid. That’s how you become confident as a freelancer. It’s slow and it happens one day at a time. But you can do it. Do you want your freelance business to take off this year … but don’t know where to start? 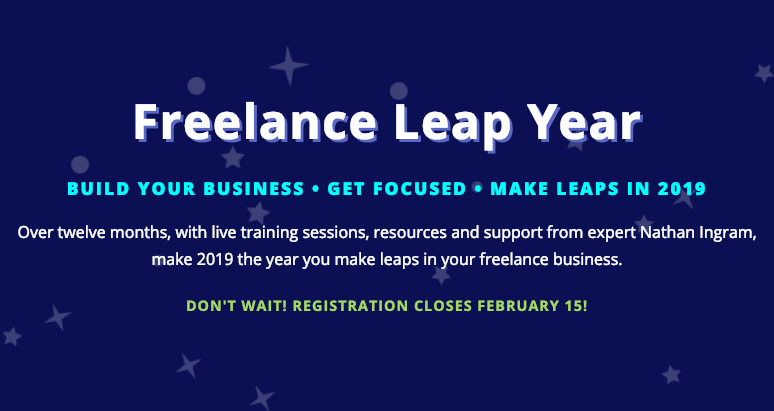 We’ve built Freelance Leap Year to help you make 2019 the year you get focused and see success and growth in your business, no matter how busy your schedule is. Designed especially for Freelance WordPress web developers & designers, make 2019 the year you make leaps in your freelance business. Over twelve months, with live training sessions, resources and support from expert Nathan Ingram.